The Boys Eagles fell to the Muskies 6-3 last night in league play. 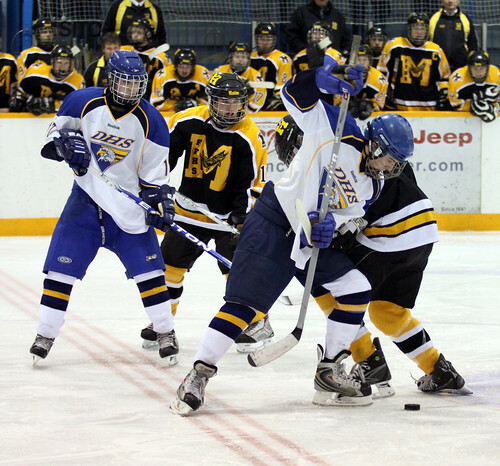 Both the boys and girls Eagles Hockey teams were at home Tuesday night, with the girls taking on the Beaver Brae Broncos and the boys meeting the Fort Frances Muskies. The boys team fell 6-3 in a tough matchup against the Muskies. Scoring for Dryden were Damon Wesley, Sheldon Adams and Matt Bartlett. The first 2 periods ended 2-2. The Eagles played well in the offensive-end putting pressure on their defense with their speed, but made some mistakes defensively, allowing too many of the Fort Frances forwards free reign below the hash marks. A late goal by Matt Bartlett sparked the team, but some undisciplined penalties allowed Fort Frances to capitalize late in the game. Goal scorers for Fort Frances were Nick Kaun, Devon Ball, Brendan Cawston, Davis Smith, Jeff Cridland and Chris Cousineau. The girls team came out ahead of the Broncos with a 3-1 win. Dryden goal scorers were Morgan Church, Carly Tardiff and Alex Wesley. The Eagles defence worked very hard, holding the Broncos to only 14 shots over the entire game. On the Broncos side Ainslie Lindquist tallied the single.